Homespun Listen & Learn Series Strengthen your skills while building a repertoire of great bluegrass banjo pieces! 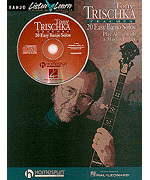 Tony Trischka has personally chosen twenty traditional banjo solos that will teach you new ideas and add to your arsenal of licks and techniques. On the CD, Tony performs each tune slowly, then up to speed, providing invaluable tips and explanations as he goes. By the time you have mastered all of these solos, you'll have acquired the basic skills necessary to play in the styles of Earl Scruggs, Don Reno, Sonny Osborne, and other bluegrass greats.